IA Design were engaged by MNG to refurbish their existing tenancy to better reflect their branding and culture. The end result is a practical, colourful and innovative space that promotes flexibility and collaboration. The brief sought an open plan, free flow design that introduced flexibility and promoted circulation and connectivity in the workplace. The reception area was opened up and a number of meeting areas and breakout zones were introduced into the space. 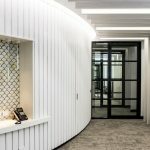 To enhance wellbeing and bring life to the office, biophilic design principles were adopted through the installation of feature timber panelling on the walls and ceilings as well as the introduction of green walls. The design and delivery of the workplace was staged to allow the continuation of business as usual throughout the process. The success of this staging came from in-depth briefing with MNG to capture a clear understanding of the operational requirements of each business department. IA Design worked closely with MNG to ensure that the project was delivered on-time and on-budget. The IA team achieved this through extensive communication with all stakeholders to ensure total transparency throughout the entire project process. The final outcome exceeded MNG’s expectations and resulted in a renewed environment that positively represents the MNG brand.